Wouldn’t it be cool if next time you visited the Atlanta Botanical Garden, you could learn more about the plants around you, the pollinators that help them to grow and bloom, and the importance of these pollinators in the world around us? What if you could then take this information home with you and plant your own pollinator garden with the same or related plants that you learn about in the Botanical Garden? Well, NOW YOU CAN. 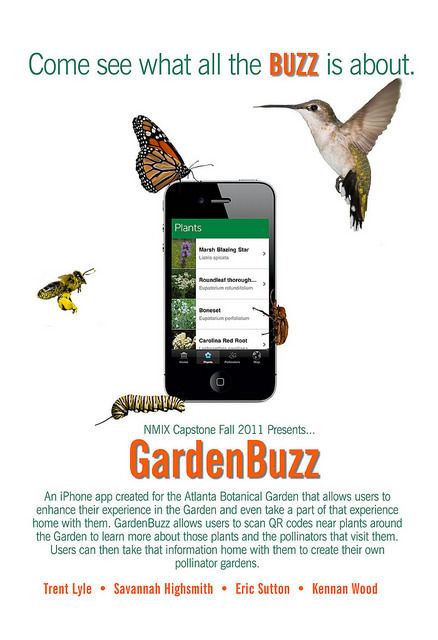 With the Atlanta Botanical Garden’s new mobile app, GardenBuzz, users have the opportunity to enhance their experience in the Garden and the ability to apply it at home. The Atlanta Botanical Garden is working with the The Greater Atlanta Pollinator Partnership to promote the importance of pollinator conservation within the greater Atlanta area. For this reason, GardenBuzz will grow to encourage knowledge of pollinators and their benefits, and will promote users to become involved in preserving pollinators by growing their own pollinator gardens. Scan QR codes placed on certain plant signage to learn more information about that plant (scientific names, when it grows, how it grows, when it blooms, pictures of the plant, etc.). You can also learn more about the specific insects and birds that pollinate the plant. There is even a map of the gardens to lead you along your visit. At home you can refer to the app to get tips on how to plant and care for the plants at home and learn how to attract certain pollinators to your own pollinator garden. This is a powerful app for learning all about the beautiful plants of the gardens and spread the important news about pollinators! Check out GardenBuzz for more information!